m in productivity hell. For the past week, I’ve been using Samsung’s Galaxy Tab S3 to read Twitter, correspond on Slack, and write articles for this website. The Tab S3 is capable of doing all these things — in some cases, it’s even capable of doing them quite well — but it’s not capable of doing them anywhere near as well as a proper laptop. And in the week I’ve had it, I’ve spent a lot of time wondering why I’d use this tablet as a portable work device instead of a cheaper, more functional computer like a Chromebook. That means that, like the iPad Pro, the Tab S3 is pitched as more than just a tablet. It’s good for laying in bed and watching Netflix, of course, but it’s also supposed to be great for bringing to the coffee shop, propping up on a tray table, or firing off a quick email while you’re on the go. That’s a much more challenging task. 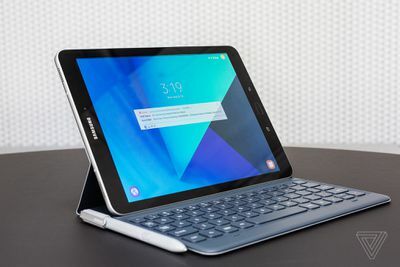 And it’s one that, combined with the full $730 asking price for this tablet and its keyboard case (sold separately), Samsung has a fairly challenging bar to meet. But first, let’s talk about the Tab S3 as merely a tablet, because that’s where it shines the most. On hardware alone, this is a really nice device. It’s thin and light. The back has a seamless design that looks like some futuristic sheet of paper. And while the front is plain, it’s the AMOLED display at the center of this thing that you’re here for: it’s sharp, vibrant, and gets bright enough to hurt. I’ve found the tablet’s performance to be quite good, too. The Tab S3 was able to run casual games like Candy Crush Saga and Subway Surfers without issue, and I was able to pull up two apps at once without seeing either start to lag (though there are other problems with multitasking, which I’ll get to later). I’ve only had the tablet for a week, and performance may deteriorate with time. But I’m not seeing any immediate cause for concern, and the tablet’s relatively modern specs should keep it running smoothly for a while. Some miscellaneous nitpicks while I have you here: the tablet’s volume rocker doesn’t adapt to landscape mode, so pressing the right side of the volume key lowers the volume, even though the tablet’s visuals indicate that higher volume should be to the right. The tablet also vibrates very loudly, and its default notification sound is a prolonged jazz medley, which… what on Earth!? One of the Tab S3’s weaker points is its cameras. Both the front and rear cameras on the Tab S3 are a functional but muddy mess — pretty much every photo I’ve taken looks like it’s been softened and smudged. It’s kind of surprising given how nice some of Samsung’s recent smartphone cameras have been. These’ll do for video chatting, but that’s it. The bigger disappointment for me was the tablet’s four speakers. The speakers are located on the top and bottom of the tablet, so when you position it in landscape to watch a YouTube video or a movie on Netflix, all the audio gets blasted way out to the left and right of you. In some cases, this creates a really exaggerated stereo effect, where it can sound like people are only talking out of one side of the tablet, and in the worst cases, well off to the side of where they ought to be. The speakers get plenty loud, and the issue isn’t always that noticeable — during a fight sequence in Captain America: Civil War, the effect almost came off as immersive — but films’ quieter sequences and, really, most YouTube clips I’ve watched have been kind of annoying to listen to. The fact that the speakers are directed to the side of you is clearly part of the reason this is happening, but I also suspect that Samsung is being too aggressive in the way it splits up audio channels, resulting in sounds that should be coming from a center channel ending up shifted way off to the side. 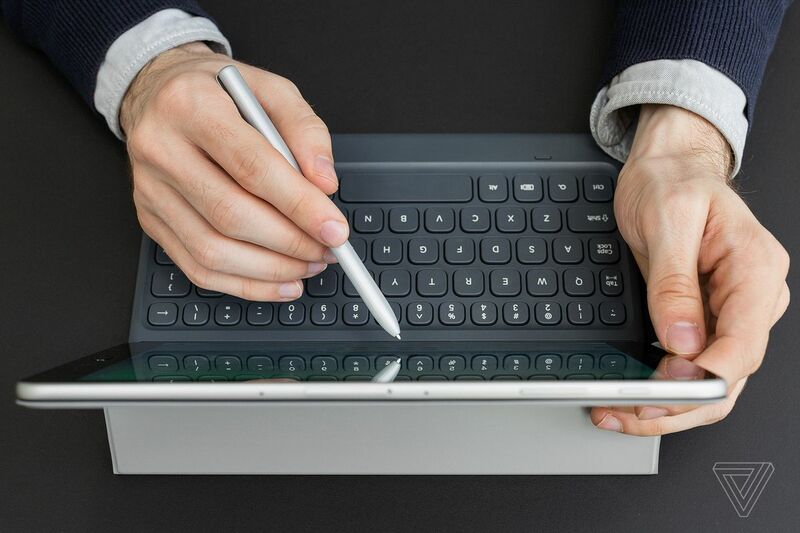 One of Samsung’s big differentiators for years now has been its styluses. 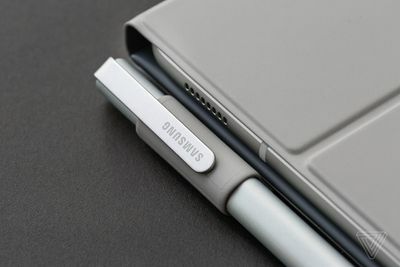 A stylus is included in the box with the Tab S3 (which is notable, since Apple’s Pencil costs an extra $99), though you’ll need to buy a case to find a place to store it — unlike the Note line, there’s no slot to slip this S Pen into when you’re not using it. But, fair enough. This is a full-size stylus and not one of those short, skinny ones that comes with Samsung’s Chromebooks and phones. The stylus is one of the best things the Tab S3 has going for it. 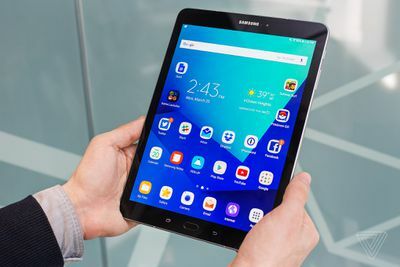 I’m not usually a huge fan of them, but Samsung has integrated the S Pen into Android enough that it feels like a natural extension of the tablet, rather than some grafted-on poking device. 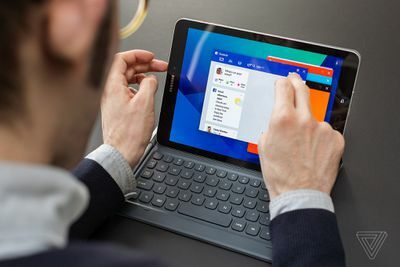 You can use the S Pen just for navigating around the operating system and tapping through apps — which is nicer than it sounds, especially when you have the tablet propped up in Samsung’s keyboard case. Or you can use it for drawing and note taking. I’m not much of an illustrator, so I can’t say how well the S Pen works for drawing (my guess is: fine for sketching, not so good for anything detailed), but it’s great for jotting down notes and making goofy doodles to send people. Samsung has some fun and useful features built in to help with this, including an option to mark up screenshots, automatically pull people or objects out of images, and create GIFs by dragging a box over a video that’s playing. Samsung has been doing styluses long enough to really nail the correct feeling when using one. 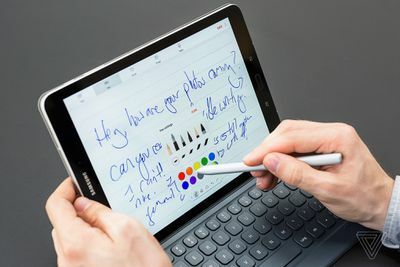 The S Pen’s tip has the perfect balance between gripping the tablet’s screen when you want to touch something and gliding over it when you want to write. It makes note taking far more pleasant than on other tablets — though, a word of warning, it only goes so far to improve already-illegible handwriting like my own. 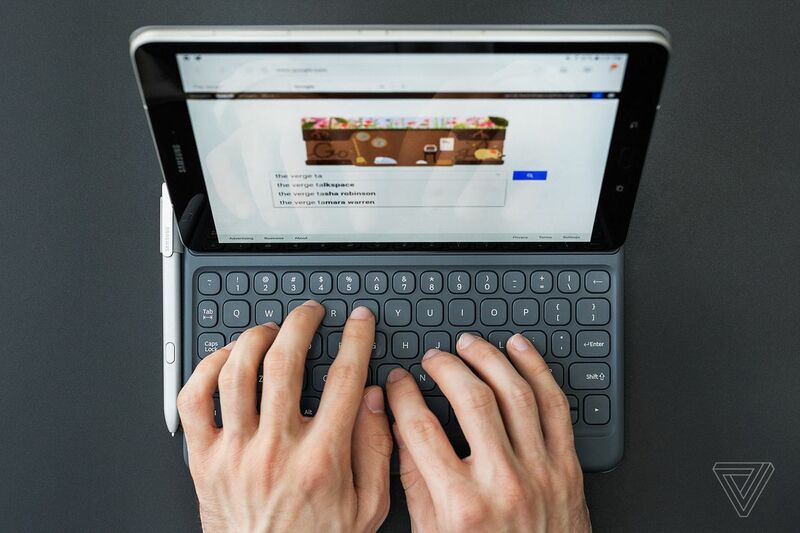 The Tab S3’s keyboard case sells for an extra $129.99, but you’re really not getting the full experience of this tablet without it. The case makes the tablet a little more heavy and a lot more ugly, and it picked up smudges quickly; but it works well as a case, a pen holster, and a stand for the tablet. As far as the actual keyboard goes, I’m not as much of a fan. 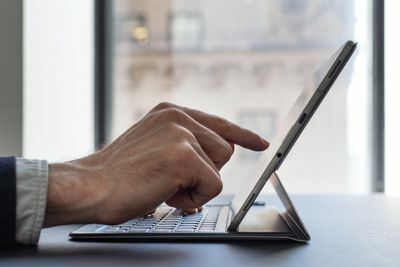 While I’ve been able to type this entire review on the Tab S3’s keyboard case, I have to tell you that my hands are feeling a little cramped and uncomfortable at this point. 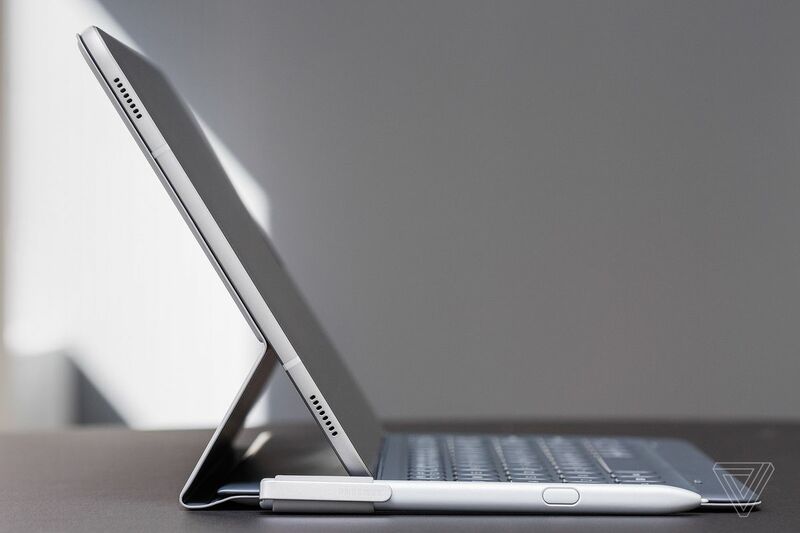 This is only a 9.7-inch device, after all, and it can’t fit the kind of keyboard we expect from a 13-inch laptop. It’s too bad. 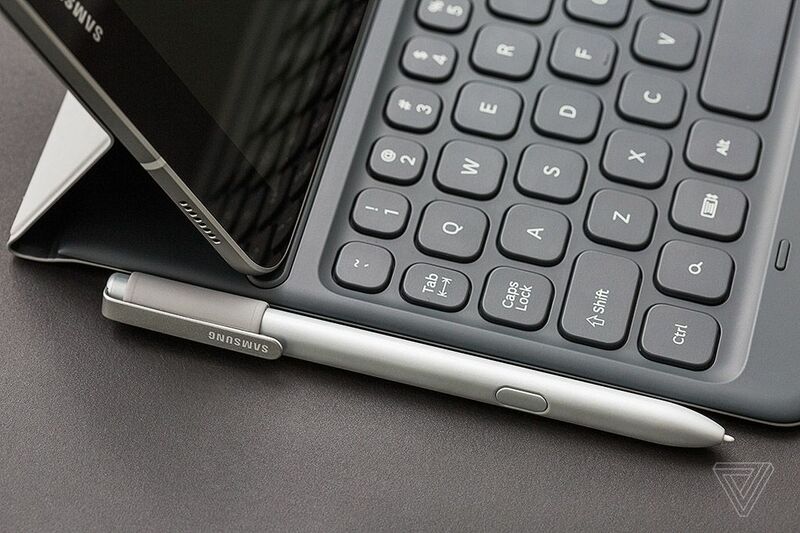 Samsung made a mostly good keyboard here, but it’s largely held back by its size. The keys have great travel and are easy to type on — they make a nice, soft clicky sound, too, which I see as a bonus — and after several days of use, I don’t even make all that many typos. But the keys are just too close together to be comfortable unless you have particularly small hands. And honestly, it’s starting to hurt. Samsung doesn’t do itself any favors with some strange key and shortcut placements, either. There’s a search key right next to the Control key, which has made me accidentally call up Now on Tap every other time I try to italicize something. And for some reason, you can’t hold Shift at the same time that you press the space bar, which it turns out is a thing I do pretty often. Samsung seems to have mapped this to be a shortcut for switching languages, which is frustrating, since the keyboard also has a dedicated language key. Samsung’s keyboard case would be perfectly fine for limited use: writing an email, responding to tweets, filling out a spreadsheet. But all of those things can be done just fine with an on-screen keyboard, too. And I have to wonder, if you’re writing something longer, why you wouldn’t just switch to a laptop. Because the real frustration of this tablet is just how close it gets to a “real” computing experience, and just how far away the gap still is. Even though Android still doesn’t have the tablet app selection that iOS does, I was able to run basically everything I needed to on the Tab S3, including work apps like Trello and Slack to more powerful sketching apps like Adobe Draw. I was able to keep up two apps at once. And I was able to research and publish articles to this website without major issue. But unfortunately, multitasking is still far from elegant, and it’s what separates this device the most from a “real” computer. One issue I ran into immediately: even though Slack supports multitasking, the app only pulled in new messages when I was engaged with it; if I tapped on the other app I was running alongside it, Slack would sit idle and refuse to show new messages that were added to the conversation until I tapped on it. That made it impossible for me to write an article and keep up with our busy newsroom chats at the same time. Even when split-screen works, it still feels clear that you’re trapped in something that’s not quite a computer. Basics like copy and paste are still designed for a keyboard and mouse more than a touchscreen and stylus — why do I still have to drag tiny little markers around each character I want to highlight instead of being able to drag the S Pen around something and have it magically carry over to another app? Samsung has some features that begin to get at this, but they don’t work with much consistency. So that puts the Tab S3 in the same place that tablets have always been: stuck awkwardly in between. Good at a lot of things, but great at few. Microsoft Teases Xbox Digital Black Friday Deals, India Discounts Soon?